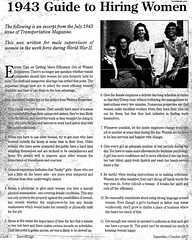 Since I mentioned recently that it's staff review time in my library, I thought it'd also be appropriate (although I use that term loosely) to post this 1943 Guide to Hiring Women. Originally published in "Transportation Magazine," I found it over on the studio twentysix2 blog, and I agree with Tom's commentary. As a male in a traditionally female-dominated field, of course I found this interesting. I work for and with women, and have women who report to me, and I'm happy to report that this is not at all applicable to 2008. All of my colleagues, professional and paraprofessional, have their jobs because they are good at their jobs - not just because they fit the uniforms we had on hand. Times change. That's a good thing.